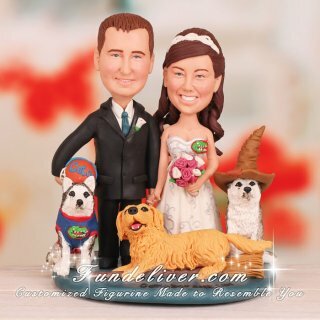 This is a completely customized husky and golden retriever theme pet wedding cake topper ordered by one of our customers. They would like the bride and groom to be in wedding dress and tux, bride holding a bouquet with pink and white flowers. The groom is wearing a white calla lily on his lapel, holding a Florida Gator football helmet. The bride hair is half up with long curls down the back. They are having a traditional wedding outside near the water (not beach) at a gazebo. Their wedding colors are teal, black and silver. They are both huge Florida Gator fans mainly football and love movies (one of their favorites is Harry Potter), so they want these to be reflected in their cake topper like adding a Florida Gator logo on the left chest of bride’s dress. They have two black and white huskies. They would like the left one to be in a bandanna of Florida Gator and the right one to be wearing the sorting hat of Harry Potter. They would also like to include their male golden retriever to ride a flying broomstick to accent the touch of Harry Potter. The cake is going to be a white fondant with black detailing on some of the layers and a teal and diamond band on all layers, in order to match their wedding colors and cake, we designed a tea colored round base with their wedding date “October 21st, 2011” sculpted on. Want to get your pets involved in your wedding? We can make it! 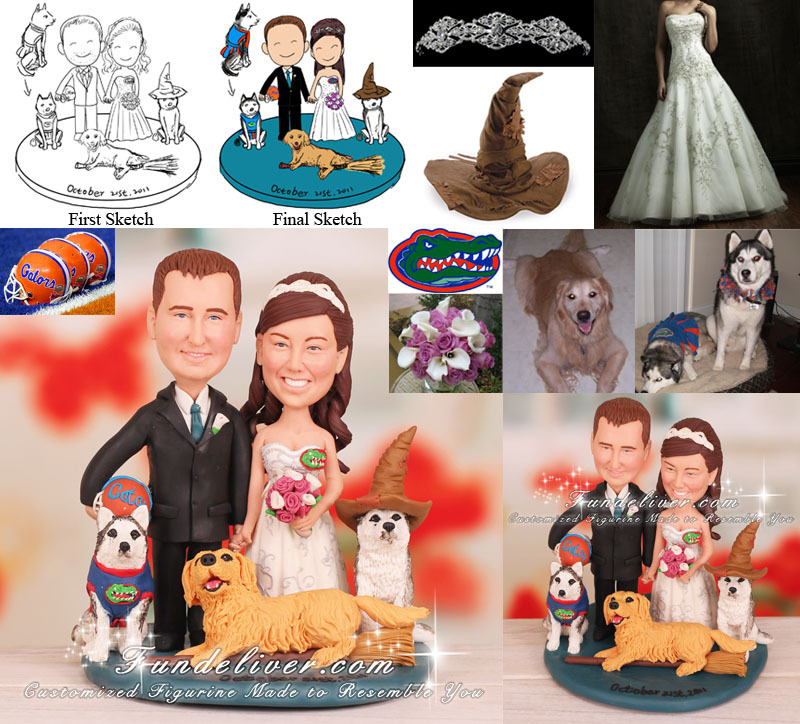 Just send us your idea and reference images about your wedding attires and pets, we can incorporate them into your cake topper to make a cat cake topper or dog and cat wedding cake topper.